MANVEL — Ever since Manvel opened in 2006, the athletic program has featured some teams that have become elite programs in the state particular football and girls basketball. While the football program has been to the state title game twice (4A in 2011 and 5A in 2017), the Lady Mavs basketball team brought home the schools first state championship in 2013. Meanwhile, Manvel track coach Kendrick Crumedy was also hard at work building an elite program that would also rise to the top at state. Crumedy saw his hard work pay off when the Mavericks captured the Class 6A UIL state championship in 2015 and again in 2017 after Manvel dropped down to Class 5A. His 2016 squad finished second in the state as DeSoto edged the Mavs at the 6A state meet. As of last May, coach Crumedy has coached his last track meet as the Manvel head track and field coach. "I am no longer the head boys track coach at Manvel," Crumedy told a recent publication. "The decision to step down was a personal decision made for family reasons." Playing a significant role as both the head track coach and one of the position coaches on the Manvel Mavericks football team, was both a successful and time consuming stint. Crumedy remained on the football staff, as the school offered him a proposition too good to pass up and inevitably keep him around. He is currently the Offensive Coordinator and the Running Backs coach for the football team. Crumedy's track resume includes several individual state champions in the 100m, 200m, 400m, and long jump. He has also coached several relays to some of the fastest times in the history of high school track and field in the United States. 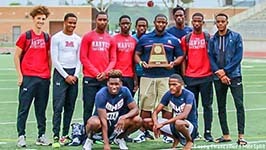 Coach Greg Bennett has taken over the Manvel program and will continue to lead the Mavericks as one of the state's best boys track and field programs in Texas.